As we round out 2018, it’s time to reflect on how the year has gone and our plans for the coming year. For the fifth consecutive year, we reached out to our customers to hear where they are in their technology journey and where they want to go in 2019. For our annual Red Hat Global Customer Tech Outlook, we surveyed more than 400 Red Hat customers around the world, with respondents from 51 countries. These IT leaders weighed in about their current challenges, their deployment strategies, technologies they are excited about, as well as budget and technology priorities for 2019. Security remains important across all questions and technology areas. Digital transformation is a "must do" but is still difficult. Cloud and containers are gaining momentum but there are still questions around strategy and security. Also, in spite of cloud and container plans, traditional virtualized infrastructure still plays a vital role for most enterprises, both for new and existing workloads. And finally, organizations seem clear that they need to standardize on an operating system to achieve the greatest benefits of using Linux across traditional, containerized, and cloud-native environments. 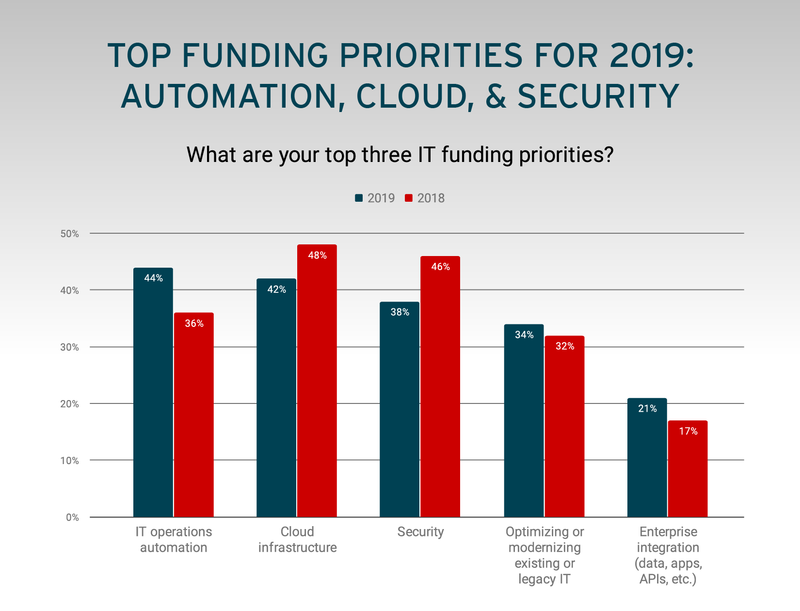 The top IT funding priorities for organizations in 2019 are IT operations automation, cloud infrastructure, and security, in that order. This same trio of priorities hit the top 3 last year; however, automation moved from third to first this year, with 44% of respondents saying it was a top 3 funding priority compared to 36% last year, indicating an increased emphasis in taking out manual operations across IT in order to increase productivity and reduce costs. This matches up with the demand and excitement we see in the market for Red Hat Ansible, our automation product family. While cloud and security dipped slightly percentage-wise from the 2018 numbers, they outranked most other priorities by a significant margin. This year’s fourth and fifth place funding priorities were optimizing or modernizing existing/legacy IT and enterprise integration. When I talk with customers, I consistently hear how integration has become even more complex with increasing business requirements around data and applications. 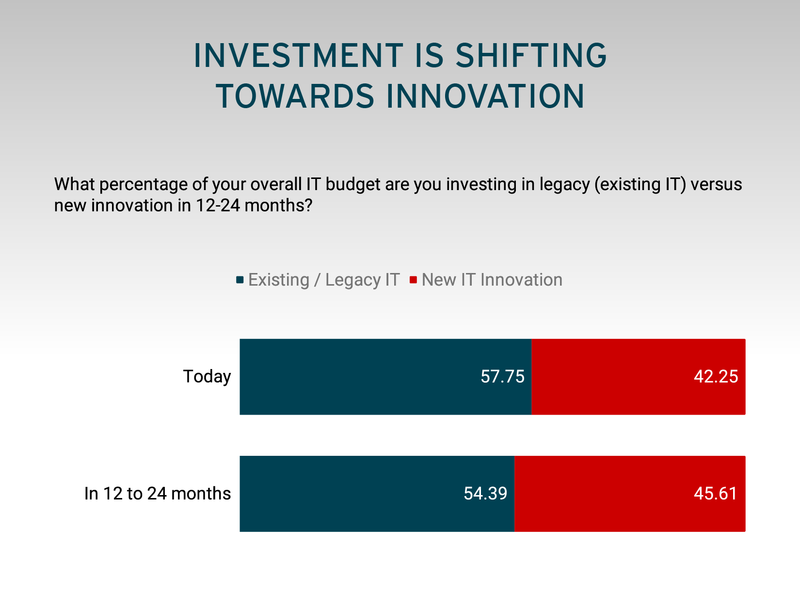 For IT optimization, organizations continue to shift investment from legacy to innovation, but for most enterprises, 50 to 60% of IT funding will still go to existing technologies. Numbers this year around investment in legacy versus new seemed aggressive, which I take as either overly optimistic or we are finally moving the needle in what we used to call the "bimodal challenge." 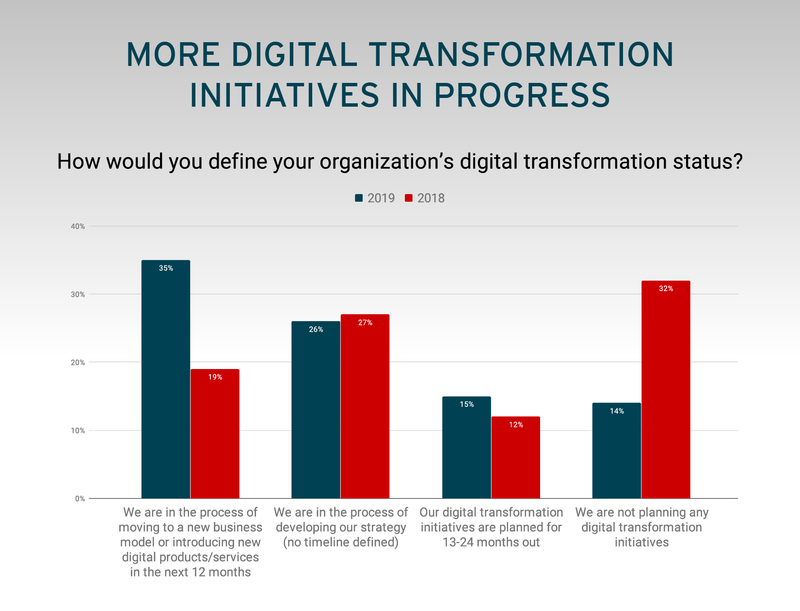 Companies are taking digital transformation (DX) seriously, and that shows in our survey results. In our previous survey, 19% of companies that responded were looking to new business models or introducing new digital products and services in the next 12 months. This year’s survey shows almost twice that (35%), with the financial services industry (FSI) leading the pack. This definitely aligns with what I’m hearing and seeing from customers worldwide. There is no longer a question around whether digital disruption will happen, but more a matter of when and how much. Organizations realize they have to shift the equation to have technology—specifically applications and digital user experiences—that can drive their competitive differentiation. Therefore, it’s no surprise that the percentage of companies not planning any transformation initiatives dropped by half, from 32% to 14%. The "put your head in the sand" strategy just wasn’t working. That being said, really developing and implementing a clear DX strategy is hard. This survey showed this, with a quarter of respondents still developing their DX strategy. This may be why we are seeing an increase in a new role that typically reports to the CIO, often called something like Digital Transformation Strategist or Digital Solutions Delivery—a trend I’m seeing in government and private enterprises alike. Even though the companies we heard from are looking to cloud, traditional virtualization is the most common infrastructure for not only existing workloads but for new application deployment as well. However, they told us this was not just virtualization done the traditional way. They want to provide virtualization to their users as a self-service cloud—51% of respondents listed virtualization as the number one technology they intend to offer as-a-service. Many of the organizations that responded have multiple hypervisors in their environment and don’t plan to bet on a single hypervisor in the next few years. From what I’m hearing from customers, they are looking to reduce the cost and complexity of their virtualized environments, but are currently using different hypervisors for different workloads or environments. I think we will see this start to consolidate as virtualization is needed as a consistent architectural fabric across environments, from on-premise to public multicloud. Just like we are seeing with the operating system. Our customers are looking to reduce the number of operating systems (OSes) they manage today. Of the customers that responded, 15% say they have 10 or more operating systems in their IT infrastructure today but that slips to 13% when asked about the next two years. Only 3% of respondents say they have a single operating system in their IT infrastructure today, and 4% hope to have a single OS within the next two years. The largest cohort has two or three OSes in their infrastructure—33% today, and 38% aspire to have two or three OSes by 2020. I have seen this trend in customer discussions, where they are looking for a single OS that can provide a consistent architectural fabric from physical infrastructure to private cloud to multiple public clouds. Part of this journey could be just getting to the latest versions of OS software, which helps organizations reduce complexity and cost as they move to a more hybrid cloud reality. We found only 6% of companies that responded have a pure public cloud strategy, and more than 20% of the respondents are still establishing their cloud strategy. This is consistent with what we’ve seen in years past. Developing and implementing a clear cloud strategy is hard, and with new technologies and challenges entering the market every day, enterprises are trying to keep up. Most organizations are pursuing a hybrid cloud strategy, with private and public cloud playing a role together and separately depending on the workload. It’s not surprising that 30% of respondents have a hybrid cloud strategy, with 45% of respondents using two or more cloud platforms today and 65% planning to use two or more within the next 12 to 24 months. Only 11% do not plan to use a cloud platform within the next two years. Seven percent of the respondents are planning to use five—or more—cloud platforms within the next two years. From our perspective, it is, and we expect it will be a hybrid, multicloud world for many years to come. For five or more years, Red Hat has been delivering on its vision of open hybrid cloud, helping customers improve their agility, interoperability, and workload portability across all IT environments, from physical to public cloud. Adoption of container technology is not as fast as the market hype would indicate, but companies are starting to hit the accelerator. Based on our survey, container usage is expected to increase by 89% in the next 2 years. On the upside, companies see the value in containers and are moving ahead with them. The biggest issues involve concerns around security and ease of use. In addition, many IT leaders still have a knowledge gap about what containers are and are not. About half of those who responded said that they aren’t sure if containers are secure, and only 42% said that containers are easy to set up. I think some of this confusion comes from container vendors and the market. Some would have you believe that all containers are created equal, and that all containers are inherently secure. There’s a reason we base our container platform on Red Hat Enterprise Linux, because we have many years experience building OS-based technologies with security in mind. Containers, like our flagship OS, must be stable and trusted for enterprise deployment. Customers still have questions about performance as well. While testing has largely shown that containers are closer to bare-metal performance than virtual machines (VMs), 45% of our respondents said they were unsure whether containers performed better than VMs and 12% responded that containers were slower than VMs. Yet the appeal and value of containers has helped increase container usage, with 57% of those surveyed saying they are using containers today—and the vast majority of those are Linux containers—and 75% expect to use containers within two years. Just 19% say they’re using Windows and Linux containers, but 36% hope to use both by the end of two years. So we see a majority using containers, but how many workloads are actually containerized? According to our survey, 37% of organizations are running 10% (or less) of their workloads in containers today. 38% are not using containers at all, but that drops to 26% in two years if all goes according to plan. Only 13% say they’re using containers for half or more of their workloads today. 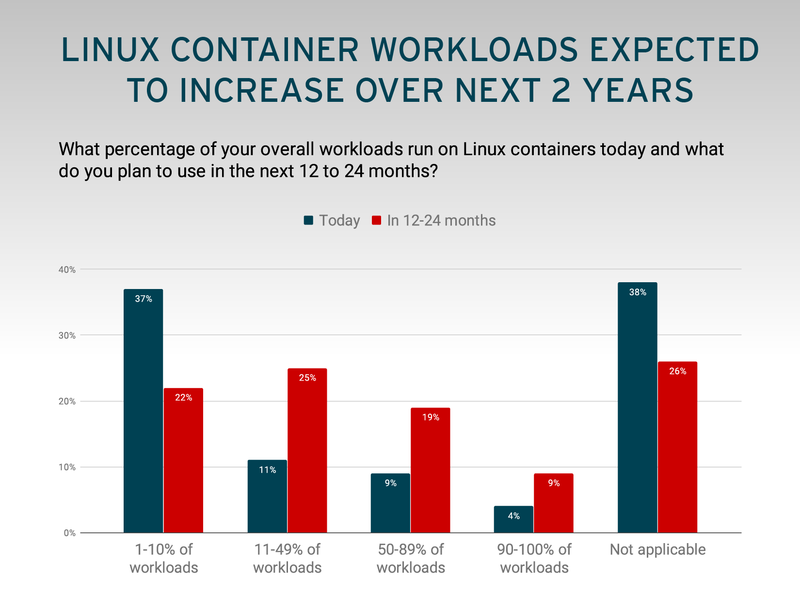 That changes in the two-year timeframe, with 28% saying they’ll run 50% or more in containers and 47% say they’ll be running up to 49% of their workloads in containers. We keep an eye on emerging technologies, and so do our customers. When asked where customers were putting their money in 2019, they put blockchain, edge or fog computing, and developer productivity tools (in that order) as the top three. How much interest is there in blockchain? Of customers surveyed, 86% said that they would consider putting budget towards blockchain in 2019. 82% were considering spend towards edge or fog computing, with telecommunications and financial services being the top industries. 57% were looking to new developer productivity tools. To sum up, it’s all about security, data insights, and developing new applications in this current world where developers are king (or queen, as I like to say). With all the security issues and data breaches in the news this past year, we added some questions around how IT leaders think about security when it comes to vendor selection and partnership. We know from this and other research that security will always come up as a top priority, challenge, investment requirement, etc. But are organizations selecting vendors based on how well that technology provider helps maintain a secure infrastructure and application architecture? The answer is, overwhelmingly, yes. Companies consider a vendor’s overall responsiveness to security vulnerabilities "extremely important." That’s 64% of respondents, followed by 30% who classify vendor responsiveness "very important," and only 2% who consider it "not important." 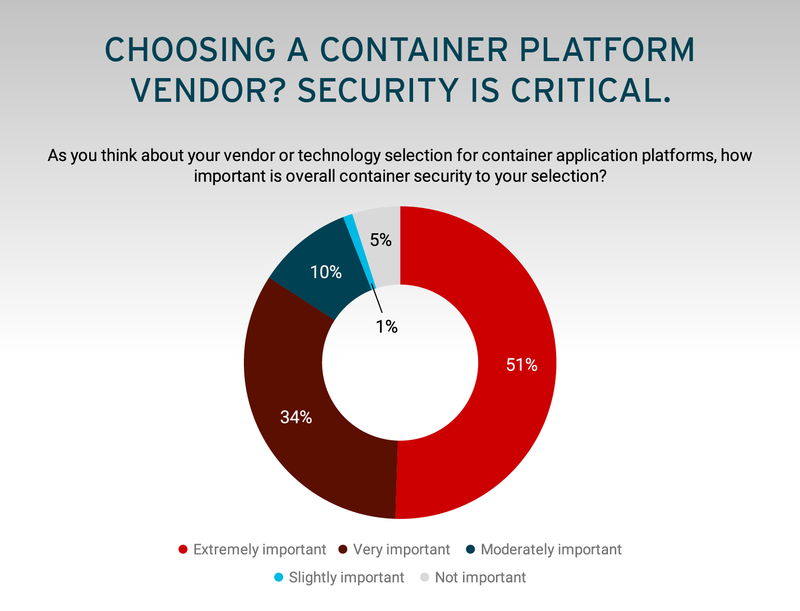 Security is also an important consideration when choosing container platform vendors. 85% of respondents consider container security extremely important or very important when choosing a vendor. As I noted in regards to containers, making open source technology more secure, stable, and supported has been Red Hat’s model since the beginning. Whether proprietary or open source, security cannot be taken for granted, and this is where vendors must partner closely with their customers to maintain a security posture that spans the entire digital transformation architecture and journey. This is only going to become more important (and more difficult) as the amount of data and the sophistication of hackers and cybercriminals continues to increase. So, who were our survey respondents? By industry, the top four respondents worked for financial services (19.4%), in technology (15.3%), in education (13.3%), or government (11.2%). The remaining 40.8% comprises respondents from all other industries. Nearly half (45.5%) were from North America, with 26.7% responding from APAC, and 25.7% from EMEA. System administrators made up 32% of those surveyed, and 26% are IT architects. Managers (16%) and directors (9%) filled out the top four. Organizations were fairly well distributed by revenue, with 22% coming from companies with less than $10 million annual revenue, 24% from companies with up to $100 million in revenue, 23% in the $100 million to $1 billion range, and 17% with more than $5 billion in revenue. The quest for digital leadership will not be just a CIO mandate, but a CEO and board priority, and the need for clear strategy and investment to achieve this will be paramount. Containers will become more mainstream across all organizations, driven both by developer demands and the need to innovate more quickly. Disparate on-premise and public cloud strategies will come together, with organizations going after a truly integrated hybrid cloud architecture. Security will become an even greater "survival of the fittest" for both enterprises and the IT solution providers working with them. Note: Numbers may not add up to 100 percent due to rounding. It’s no surprise that the percentage of companies not planning any transformation initiatives dropped by half, from 32% to 14%. The “put your head in the sand” strategy just wasn’t working.